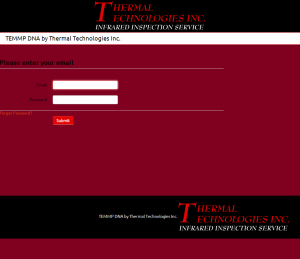 thermal | Thermal Technologies Inc. Thermal Technologies, Inc. was born 25 years ago with 1 man and a camera. As a technology that few understood at the time, Thermal Technologies visions were to advance and become a well-known brand name in the industry. As time progressed, industry leaders in the maintenance field have made that dream possible. Many changes have occurred during that 25 years in the infrared industry as well as here at Thermal Technologies. As the ever changing world of technology progresses, an impressive change that is currently in process here and will be completed very soon will be the on-line version of the TEMMP DNA software package. This software has the capabilities of reviewing history of thermal anomalies located since the inception of the barcode program as well as logging your repairs into our database, and if Thermal Technologies completed your arc flash study, the information collected during the assessment will also be available for viewing. Hurry, don’t miss out on this premium package. Act today and get ahead of the game with an introductory price of $995.00 if you sign up before the package is available on-line. More details to come as the software is launched in the coming weeks.